Plans are underway for one of the first full-service Praxis Marketplace grocery stores and a large-scale food production center in Austin that is expected to create more than 600 permanent jobs in the community. Praxis Foods and Marketplace founder and CEO Glenn Ford said he would not yet release the exact addresses for the store and its separate aquaponic farming center to the public because his company is in the midst of negotiations with property owners. But he did say Austin’s store and indoor farm would be located in the 29th Ward and open sometime in 2014. He said he wants to build stores in inner cities that he – and his mother – would be proud of. Ford, originally from Chicago’s Englewood neighborhood but now living in Minnesota, said he has plans to open other stores on the South Side and in other cities, including Baltimore, Atlanta, Kansas City, Minneapolis and Washington, D.C.
Everyone should have access to a healthy variety of foods, he said, and if residents want to, they should be able to have a prepared meal they can either sit in the store and eat or take home. Ford’s vision is to put an infrastructure in place that creates jobs and wealth in the community by allowing residents to be a vital part of the store’s food supply chain. Enyia met Ford while working as a public policy analyst on the issue of food security and education policy, among other topics, at Chicago’s City Hall under Mayor Richard M. Daley. She said from day one Ford was open to coming into the community. And there are many people in Austin who at one point have been told that they make a great sweet potato pie or mac and cheese, Enyia said, but they don’t know how to get into the market to sell their products. She said she thinks people from the community will take Ford up on his offer to help supply his store. “I think there is an appetite for that,” she said. In addition to its food supply, other services the company would seek locally include snow removal and uniform cleaning, among others. The grocery store is expected to be about 40,000 square feet and will employ up to 150 people from the community. It will stock fresh, organic and non-organic products and will include a café area where customers can sit to eat a freshly prepared meal. An additional 450 permanent jobs are expected to come from the aquaponic site and other operations, Enyia said. A good portion of the store’s fresh produce and fish will be supplied from its aquaponic farm. Aquaponics grows fish and plants together. Leafy greens, including various kinds of lettuce and herbs and even cucumbers and tomatoes are grown in mineral-enriched water without soil. The process uses far less water than conventional farming, and nearly everything is recycled. The waste from the fish serves as nutrients for the plants, and the plants filter the water for the fish. “There’s a whole litany of items that can be grown,” Ford said, adding that aquaponics is a very clean process. The goal of the venture, Ford said, is to do something of such scale, employing a large number of people and then being able to continue to add on to that. “It is going to be enough of a presence that it is sustainable, it’s fairly green, and it’s something that these communities can have for a lifetime,” he said. Enyia said this project has the ability to create jobs for the hard-to-employ to highly educated people, and Praxis will go to Austin residents first to fill them, she said. Ald. Deborah Graham (29th) has also been a big supporter of the project, Enyia and Ford said. Ford presented his plans at the alderman’s state of the ward address last month. The project is expected to cost about $25 million and most of that will come from investors, Ford said. Graham added that tax-increment financing funding is a possibility the team is considering. Enyia, Ford and Graham met with Gary, Ind., Mayor Karen Freeman-Wilson and some members of her team Thursday to show how various economic development efforts in Austin, including a Praxis Marketplace and an urban agriculture site, could also benefit the city of Gary. 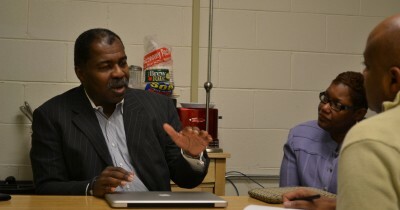 Glenn Ford (left) and Gary Mayor Karen Freeman-Wilson (right) discuss economic development on Chicago’s West Side. Enyia told the Mayor that Austin has a strong manufacturing history, and although the infrastructure is mostly vacant due to disinvestment in the community, it could be used again as an asset for the community. The group toured three economic development sites on the West Side near the intersections of Bloomingdale and Central Avenues; Chicago and Central Park Avenues; and Cicero Avenue and Lake Street close to the Cicero Green Line “L” stop. Serethea Reid of the Central Austin Neighborhood Association was at Graham’s ward meeting in January. She said she’s happy to see a positive business and employment opportunity come to the community. “It’s far superior as an additional business in the Austin community when compared to another pawn shop or another liquor store,” Reid said. Though he lives in Minneapolis, where he’s also opening up a store and an aquaponic site, Ford has not forgotten his inner-city roots. Nor have others working with him. Eight out of his 10 executives were also raised in inner cities, including four from Chicago. Ford founded the emerging company in 2009. “We’re coming back home after having ventured the world, if you will, and saying we believe there are better food expressions that are possible in our communities than what we see,” Ford said. Ford also has his eye on opening two other Chicago stores in 2014: one along 63rd Street and another in the 96th Street and Cottage Grove Avenue area, he said. The Minneapolis store is also set to open in 2014, but its aquaponic food production site will be up and running in less than 90 days, he said. Ford said he wants community members to know that this store will be theirs. The company wants to make food suggestions to the community but doesn’t want to impose, he said. But if it were completely up to Ford, he said the store would be all organic. He said the company also wants to be careful how much high fructose corn syrup is included in some of the products that will be on the shelves. From 2 to 7 p.m. stop by Columbus Park (Tuesdays), La Follette Park (Wednesdays) and Austin Town Hall (Thursdays).